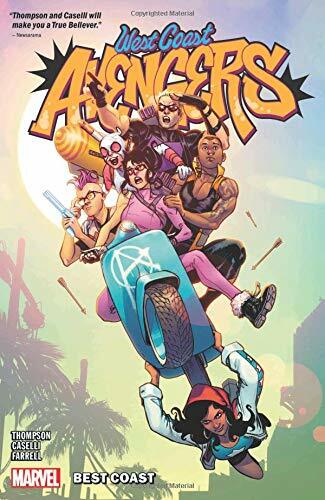 With a new leader and a (mostly) new line-up, the West Coast Avengers are back in business again. Although, that makes it sounds like their reforming was the result of a prudent, long term study that postulated the theory, and also supported the idea, that the relatively superhero free West Coast could use its team of Avengers to defend it against all manner of threats, foreign, domestic, super-powered and extra-terrestrial, which unfortunately isn’t the case. The West Coast Avengers are only back together thanks to “fortuitous” circumstance and a “happy” accident involving giant land sharks and a beleaguered Hawkeye, the new one, reaching out to the other Hawkeye, the old one, when she’d exhausted just about every other possibility and had run out of numbers to call and favours to ask. A call which prompts the question ‘What do we next time?’ and leads to Hawkeye and Hawkeye, honestly it’s not as confusing as it sounds, assembling their own rag-tag bunch of LA based Avengers. And Best Coast is the tale of how this motley bunch came together and saved their city from the attentions of a former criminal mastermind wearing a new face in order to fit with all, and become one, of the beautiful people and his army of B-movie, fifty foot monsters that includes a founding member of the original West Coast Avengers.